On this date in 1692, Tituba, a slave owned by Reverend Samuel Parris in Salem, Massachusetts, broke down and confessed to bewitching several children who were suffering from mysterious ailments. She was one of the first three women accused of witchcraft in Salem, and by the end of 1692, the other two women would be dead and Tituba would be languishing in a jail cell until some unrecorded person paid her jail fees and took her away from Salem, after which she disappears from the historical record. My students are currently reading Arthur Miller’s fictionalized account of the Salem witch trials, The Crucible. Though this drama is frequently taught in schools, it’s not exactly my favorite play. It’s a little heavy-handed, and Miller’s frequent interruptions early in the text don’t allow readers to form their own opinions of the characters (those passages could all be in a historical note at the end, I think). However, students do tend to respond to the play for a lot of reasons, one of which is that witch hunts are very much a part of our society even today. It is a fascinating time in our nation’s history. Certainly we would like to think that we have evolved beyond accusing our neighbors of being witches. How preposterous! As we study the play, I ask my students to engage in an online scavenger hunt to learn more about the historical trials and about similar events in history. I asked my students what they found interesting, and invariably one of them mentions the fact that the witch trials were so similar to other events in history in which entire groups of people were cast under suspicion, sometimes tried and convicted, and sometimes even murdered—the Red Scare, the Holocaust, the Japanese Internment Camps. I voted today because our country is in danger of engaging in another witch hunt. We have a presidential candidate who suggests that we prevent Muslims from entering the country until “until our country’s representatives can figure out what is going on.” And I think of my students sitting in my classroom. Some of them are Muslim. I think of Ahmed, who sat in my classroom last year. One of the gentlest, humblest, most unassuming people I have ever known, Ahmed was briefly jailed in Djibouti when he traveled there to get his visa to attend school in America because of a case of mistaken identity—he is Somali, and when police officers heard his accent as he spoke with his friend, they arrested him because another Somalian was suspected of engineering a car bombing in the city that day. Ahmed is one of the hardest-working, most earnest, kindest students I’ve ever taught. But because he is Muslim, there are people in our country who would prefer at best that he not enter the country and at worst that he didn’t exist. And they don’t even know him. People have always probably feared “the other” and what they don’t understand in life. The danger in holding fast to that mindset, however, is that we not only miss out on some amazing people but also that we do great harm. I voted because I do not want a man who doesn’t even know my students, who can’t understand how wonderful and amazing they are, and who scares me to death to become president. If I had Donald Trump in front of me, I might just make him read The Crucible. Sadly, I think he’d miss the point. I don’t typically write about politics, but I vote. I teach students about the ways in which our literature is both a window and a mirror, and I encourage them to vote, too. One of the reasons I teach is that I think my students can change the world, and I want them to be armed with the understanding, knowledge, and insight they need to do it. I don’t want them to go into the polls ignorant about who and what they are voting for. What an awesome post! I live in a section of Iowa that is very unique: one town is lily white, while the next town has a number of nationalities. The diversity isn’t always here, so to feel that need to vote for so many reasons, it makes me happy to know people out there do get it! 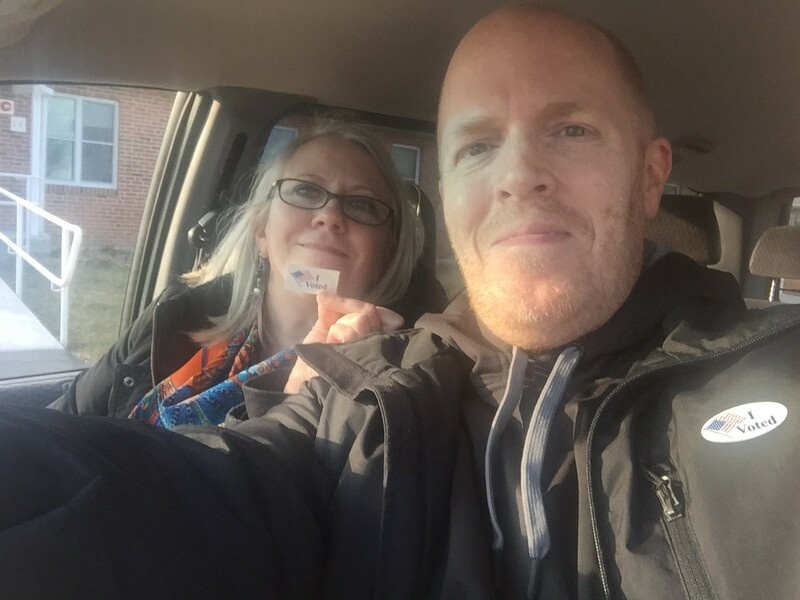 Here in Iowa, we caucus, so we don’t get the cool “I voted” stickers, so I had to comment on that too! 🙂 Thank you for sharing with us! Iowa politics are so interesting! I have some roots in Iowa (my great-grandfather was born there and moved out west to Washington, but his parents lived there until they died). Georgia has really cute stickers with peaches on them. I sort of miss the Georgia stickers! Dana, your SOL post gave me hope today. I have to believe that there are voters out there who are compassionate and thoughtful beyond my circle of friends. Reading your slice gives me a ‘face’ when I hear reports about voters in the Super Tuesday states. Thanks. 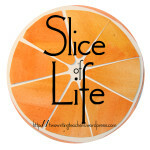 Keep “slicing”. I think your students must be very lucky. Thank you! I really appreciate it, and thanks for stopping by and commenting, too! This is fabulous, Dana. I just finished writing a letter of recommendation for an Iranian student who is also a kind soul. Many of my ISU night class students are Muslim, too. I’ll be honest: I’m scared. Thanks! I wish some of the people who are going to polls knew people like our students. It is horrible that we have to actually know someone for us to stop “otherizing” and see people as individuals. What a great post! It is sad how much witch-hunting and blame-placing seems to drive humans… Even though The Crucible was written as a direct allegory for the HUAC trials, its message certainly applies to so many times in history. I voted today too, and I will keep hoping against hope that we as a nation, and as humans, can find the empathy we so clearly need come November!!! Empathy is such an important reason to read literature. Thank you for stopping by and for commenting! I think that if we could all walk in someone else’s shoes for a day, we would all expand our empathy. Here we weren’t part of Super Tuesday nationally, but have a special election for our city school board. I’m proud to wear my I Voted sticker. Me too! One of the reasons I love teaching literature is that it allows us to live vicariously through others and walk in their shoes. Great post, Dana! I almost cried because it was so honest. You spoke the truth from your experience as a teacher. I hope others voted tonight on their conscience and in the belief that, in the end, we are all similar and want the same things. I’ll be following the results later tonight. Aw, thank you! It looks like we’re in it for the long haul after the results from yesterday. Love the Crucible connection and how you wove the pieces together. I too think about my Muslim students and all of the immigrant parents–hard working people–we have in our school’s community. Thank you being brave and for writing about voting. Thank you, Lee Ann. I always feel like I’m sticking my neck out with politics, so I rarely talk about it. Dana, Thank you for this thoughtful piece. You passion for what is right is downright refreshing in today’s climate. We are arming our students with skills and understanding to thrive in a world that is often hard to understand.